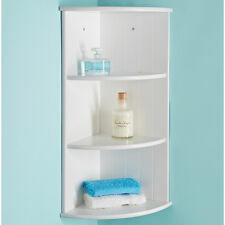 Bathroom caddy look no further than our range. needed: Just extend the caddy to. toothbrush, flannel, there's more than enough room for. Shampoo, soap, conditioner, shower gel, shaving gel, razor. bath or ceiling to floor. Pieces Included: 1 Soap dispenser, 1 toothbrush holder, 1 tumbler, 1 soap dish, 1 toilet brush, and 1 wastebasket. Great for all bathrooms: Designed to fit any-sized bath, this bathroom bundle set conveniently saves on space while still managing to serve multiple users. This white plastic shower organiser is a real space saver. It will leave your shower looking tidy & stylish. Adjusts to fit almost every bathroom. It also features non slip, non scratch rubber pads at the top & bottom. Wire Accessories. 5.25" width. 24" - 35" length range. Here are 3 storage jars and a cache pot with a classic Rose design from Hadida. The jars are 6.5" tall with the lid in place and the planter is 4" tall. Wenko Polaris soap dispenser, toilet brush and tumbler set made from high grade ceramics. Toilet Brush. Ceramic Tumbler. Soap Dispenser. 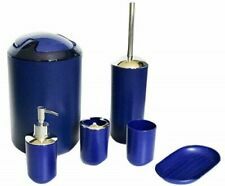 Wenko Cordoba blue high grade ceramic bathroom set. 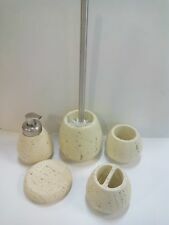 • Decorative, bathroom set consisting of 1 toilet brush and holder, 1 soap dispenser and 1 tumbler. • Tumbler 6.5 x 12 x 6.5 cm• Soap Dish: 10.5 x 2.5 x 10.5 cm. 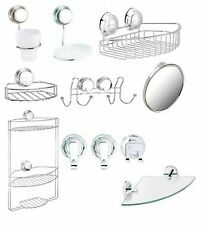 This super suction wall mount corner shelf would be a luxurious addition to bathroom or kitchen. Suction cup system. Super suction. SHELF SIZE : WIDTH 28CM X DEPTH 18CM APPROX. Wire Accessories. 27" - 29" length range. Wenko Pottery soap dispenser, toilet brush and tumbler set made from high grade ceramics. • Wenko product code: 22648100. • Refillable soap dispenser for a balanced distribution of lotion or liquid soap. 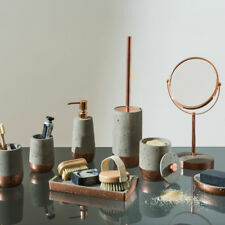 Set includes soap dish, toothbrush holder, cup and soap dispenser, as pictured. Beautiful House Gallery hand-painted china bathroom set in blue and white.